Let’s get this out of the way. God of War 2 was the crowning achievement of my PS2 gaming days. 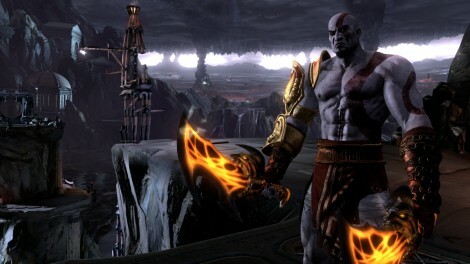 I am a huge Kratos fan. I’m big enough fan of the niche of the action genre that GoW created, that I shelled out cash for the recent soulless knock-off, Dante’s Inferno. I held off on purchasing a PS3 for a long time, but God of War 3 was where my motivation started every time I was weighing the decision. It was a game I never doubted, never questioned. I try and avoid putting games or movies on a pedestal or raising my expectations, but this game was a sure thing, the safest bet in the industry. All it had to do was be a mindless sequel – be bigger and add more. Seems simple enough. Excuse me, what’s my motivation? I absolutely love the fact that this game picks up pretty much the second after GoW 2 ended. Fighting along side the Titans couldn’t be a better showcase for the PS3’s power as well as an emphatic intro to how far this game has come in style, graphics, and the flow of combat. Witnessing it is definitely worth the price of admission, and it made me happy to be holding a PS controller in my hands once again. However, once the initial adrenaline shot wore off, I found myself ready for things to go up another level, and for me, it never happened. My jaw never quite hit the floor, I never jumped off the couch, I never felt like replaying a segment right after I was finished. Something was missing. Instead, I found myself distracted by the story. Struggling to find any connection to the motivations of Kratos. The more he harped about revenge, the more shallow his actions seemed. About halfway through, I stopped caring, and just enjoyed the action. I was content again, ripping through my enemies with mindless abandon. Then, the ending throws it all back in your face. Without giving anything away, they try adding depth to the story and characters at the last second, and I wasn’t buying it. The inconsistency just made me care even less about the story they were wrapping up. This is a shame because they really took their time with crafting the ending and the presentation was fantastic. They just couldn’t decide if this was a mindless action game where you play as an unstoppable and uncaring monster, or a story with a strong message and a complicated cast of characters. Part of the reason I was even involved in the story was because the combat was a lot less tactile than I remember from the previous games in the series. The developer’s did an amazing job perfecting the fluidity of the combat and it looks flawless on screen. It is too polished though, as making contact with the enemies just didn’t have enough feedback to know when you missed, hit, or hit harder. In the end, it felt more like a choreographed dance with absurd amount of gore than a fight. I was removed from the action and trying to find more to the story to compensate. In between the fights and the puzzles, I was surprised to find myself struggling so much with traversing the levels, especially when it came to jumping to and from platforms. I easily had 3 times as many deaths by falling or missing a jump as I did in combat. Most of the time these were even because of invisible walls or mistiming a double jump. A few of these I can attribute to just gamer error, but after a while I just became annoyed which removed me from the game even more. Don’t even get me started on the platforming in the labyrinth, nothing is more aggravating than solving a puzzle and being prevented from advancing because you can’t judge the height or width of a gap from the single viewing able available. This isn’t to say, I disliked my time with God of War 3. Certainly, there were some stand out moments. I had a lot of satisfying kills, especially on the centaurs and manticores. I liked the changes to the quick time events, as once I got used to them, I was able to watch a bit more of the brutal kills than in the other games. I was in awe of the labyrinth, and grew to love the level design and how the different areas of the game were tied together. My favorite character may not be on screen long, but the portrayal of Hera, was both brilliant and hilarious. I never felt like I was trudging through the game or being forced to finish it. The action scenes are balanced with interesting puzzles just like the rest of the series. The enemies stay varied enough to keep things interesting and to keep you trying new tactics as you earn and upgrade the new weapons. The boss encounters are equally varied in scale, as you can tell an effort was taken to make each one unique while still working with the tried and true combat system which is still the best in the genre. If this was a new franchise or a new developer, I don’t think I would have been as derailed by the combination of seemingly small flaws. This isn’t the case though, this is God of War. God of War 3 is such a weak conclusion to a great series that now I think it would have been better served to just end the game after the first entry. Standing alone it is a solid action title. It is just frustrating to see a series with such mind blowing potential and visceral appeal, die without a fight.